Whether you require entrance gates, driveway gates, pedestrian gates, garden gates or field gates, even wooden garage doors. Our Bespoke wooden gates service ensures that your gates will be a perfect fit for any size opening. 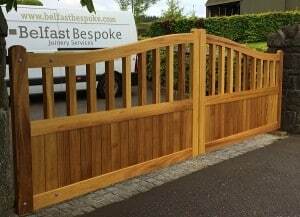 We are specialists in manufacturing all manner of solid, handcrafted, wooden gates in Belfast and the surrounding areas. We manufacture some of the finest wooden gates in the country and we’re proud of it. Our made to measure wooden gates are a great way to add both a unique sense of elegance and style but more importantly security to your property. Using only the highest quality, hand selected, kiln dried timber, all our solid wooden gates are individually hand made. Traditional craftsmanship along with a little help from some modern machinery ensures you receive the highest quality product from Belfast Bespoke. Your new wooden gates will be produced in your preferred style and the hardwood or softwood of your choice. Our most popular woods include, Iroko, Cedar, Sapele, Oak and Redwood. Whether you prefer the beauty of the natural wooden look or a more traditional painted finish, we can advise on the most suitable timber. Our unique styles can either provide total privacy using traditional tongue and groove boarding or decorative panels, or a more open wooden gate can also be created with wooden or steel spindles. Our bespoke garage doors are becoming more and more popular.We offer a wide range of wooden garage doors that will complement the appearance of your property. These traditional garage doors offer security and durability against the elements. Individually made wooden garage doors and matching frames handcrafted to your exact requirements.